Eonian Records is a young label based in Indianapolis working a great niche market: discovering and releasing great archival melodic hard rock, much of which comes from the glorious days of the 1980's. Eonian attempts to find overlooked bands with a strong presence, exciting sound and good production with strong regional and sometimes national followings but never got signed. Some of these bands you may recognize because of this, others probably not like Charlemagne and High Noon, both out of LA in the late 80's and early 90's or Pistol Dawn from Chicago. This month Eonian releases two more gems: Uzi, also from Chicago, reviewed here and Shake City from Hollywood reviewed separately here. 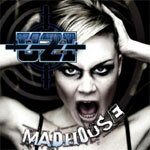 Uzi, influenced by the metal rock wave ridden by bands like AC/DC and Motley Crue, bursts from the gates with full force, pedal to metal, hook laden and groove driven hard rock on Madhouse. Title track, Rocker, and the rippin' Do What I Do throw caution to the wind with swaggering riffs and blistering tempos within a huge arena sound. Later, the explosive Raise Hell and the nasty, sarcastic Wreckerd Man blow the roof off. In the end, Madhouse is a heck of a lot of fun and a good ride. Very recommended! Chicago based Uzi delivers solid swaggering late 80's melodic hard rock on Madhouse, another wonderful archival gem from our friends at Eonian Records.